Mahatma Gandhi (born as Mohandas Karamchand Gandhi in Porbandar, Kathiawar Agency, British India, died in New Delhi, Dominion of India) was a famous Leader from India, who lived between October 2, 1869 and January 30, 1948. He became 78 years old. Mohandas Karamchand Gandhi was an Indian independence leader and statesman, known for his role in India's struggle for independence from Britain. 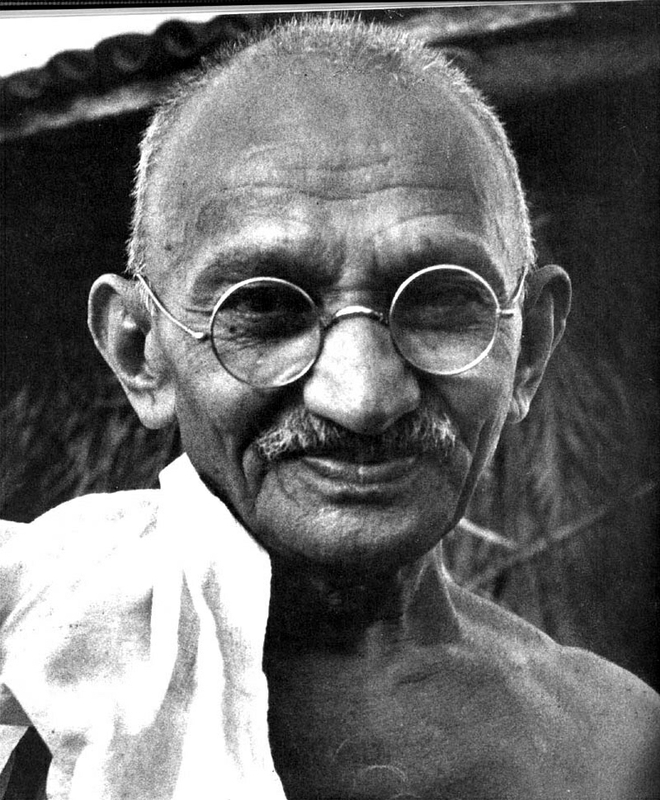 He is remembered primarily for his use of non-violent methods of civil disobedience in the struggle for liberation, rooted in the religious concept of ahimsa. The modern pacifism is largely based on Gandhi's nonviolence philosophy. Gandhi considered the "father of Indian nation," and his birthday, 2 October is national holiday throughout India (Gandhi Jayanti). He is born under the zodiac libra, who is known for Balance, Justice, Truth, Beauty, Perfection. Our collection contains 160 quotes who is written / told by Mahatma, under the main topics: Religion, Anger, History, Love, Men. "The human voice can never reach the distance that is covered by the still small voice of conscience"
"There is an orderliness in the universe, there is an unalterable law governing everything and every being that exists or lives. It is no blind law; for no blind law can govern the conduct of living beings"
"I would heartily welcome the union of East and West provided it is not based on brute force"
"Satisfaction lies in the effort, not in the attainment, full effort is full victory"
"The pursuit of truth does not permit violence on one's opponent"
"We should meet abuse by forbearance. Human nature is so constituted that if we take absolutely no notice of anger or abuse, the person indulging in it will soon weary of it and stop"
"Culture of the mind must be subservient to the heart"
"Everyone who wills can hear the inner voice. It is within everyone"
"If I had no sense of humor, I would long ago have committed suicide"
"If patience is worth anything, it must endure to the end of time. And a living faith will last in the midst of the blackest storm"
"It is the quality of our work which will please God and not the quantity"
"Let us all be brave enough to die the death of a martyr, but let no one lust for martyrdom"
"Non-violence and truth are inseparable and presuppose one another"
"Non-violence is the greatest force at the disposal of mankind. It is mightier than the mightiest weapon of destruction devised by the ingenuity of man"
"The main purpose of life is to live rightly, think rightly, act rightly. The soul must languish when we give all our thought to the body"
"There is a sufficiency in the world for man's need but not for man's greed"
"We do not need to proselytise either by our speech or by our writing. We can only do so really with our lives. Let our lives be open books for all to study"
"I believe in equality for everyone, except reporters and photographers"
"Religion is a matter of the heart. No physical inconvenience can warrant abandonment of one's own religion"
"You must not lose faith in humanity. Humanity is an ocean; if a few drops of the ocean are dirty, the ocean does not become dirty"
"Honest disagreement is often a good sign of progress"
"If we are to teach real peace in this world, and if we are to carry on a real war against war, we shall have to begin with the children"
"It is my own firm belief that the strength of the soul grows in proportion as you subdue the flesh"
"Just as a man would not cherish living in a body other than his own, so do nations not like to live under other nations, however noble and great the latter may be"
"Let everyone try and find that as a result of daily prayer he adds something new to his life, something with which nothing can be compared"
"Providence has its appointed hour for everything. We cannot command results, we can only strive"
"Rights that do not flow from duty well performed are not worth having"
"The spirit of democracy is not a mechanical thing to be adjusted by abolition of forms. It requires change of heart"
"Constant development is the law of life, and a man who always tries to maintain his dogmas in order to appear consistent drives himself into a false position"
"Non-violence is the article of faith"
"Prayer is the key of the morning and the bolt of the evening"
"Truth is by nature self-evident. As soon as you remove the cobwebs of ignorance that surround it, it shines clear"
"Truth never damages a cause that is just"
"Each one has to find his peace from within. And peace to be real must be unaffected by outside circumstances"
"Fear has its use but cowardice has none"
"Healthy discontent is the prelude to progress"
"Justice that love gives is a surrender, justice that law gives is a punishment"
"My religion is based on truth and non-violence. Truth is my God. Non-violence is the means of realising Him"
"No culture can live if it attempts to be exclusive"
"Violent means will give violent freedom. That would be a menace to the world and to India herself"
"Violent men have not been known in history to die to a man. They die up to a point"
"I am prepared to die, but there is no cause for which I am prepared to kill"
"Non-violence is not a garment to be put on and off at will. Its seat is in the heart, and it must be an inseparable part of our being"
"Prayer is not asking. It is a longing of the soul. It is daily admission of one's weakness. It is better in prayer to have a heart without words than words without a heart"
"Purity of personal life is the one indispensable condition for building up a sound education"
"Every formula of every religion has in this age of reason, to submit to the acid test of reason and universal assent"
"I claim to be a simple individual liable to err like any other fellow mortal. I own, however, that I have humility enough to confess my errors and to retrace my steps"
"I do all the evil I can before I learn to shun it? Is it not enough to know the evil to shun it? If not, we should be sincere enough to admit that we love evil too well to give it up"
"The law of sacrifice is uniform throughout the world. To be effective it demands the sacrifice of the bravest and the most spotless"
"There is no principle worth the name if it is not wholly good"
"Those who know how to think need no teachers"
"Those who say religion has nothing to do with politics do not know what religion is"
"Though we may know Him by a thousand names, He is one and the same to us all"
"To believe in something, and not to live it, is dishonest"
"To deprive a man of his natural liberty and to deny to him the ordinary amenities of life is worse then starving the body; it is starvation of the soul, the dweller in the body"
"To give pleasure to a single heart by a single act is better than a thousand heads bowing in prayer"
"We win justice quickest by rendering justice to the other party"
"What do I think of Western civilization? I think it would be a very good idea"
"What is true of the individual will be tomorrow true of the whole nation if individuals will but refuse to lose heart and hope"
"Whatever you do may seem insignificant to you, but it is most important that you do it"
"When restraint and courtesy are added to strength, the latter becomes irresistible"
"Where love is, there God is also"
"An unjust law is itself a species of violence. Arrest for its breach is more so"
"Anger and intolerance are the enemies of correct understanding"
"Anger is the enemy of non-violence and pride is a monster that swallows it up"
"Are creeds such simple things like the clothes which a man can change at will and put on at will? Creeds are such for which people live for ages and ages"
"As human beings, our greatness lies not so much in being able to remake the world - that is the myth of the atomic age - as in being able to remake ourselves"
"Before the throne of the Almighty, man will be judged not by his acts but by his intentions. For God alone reads our hearts"
"But for my faith in God, I should have been a raving maniac"
"Capital as such is not evil; it is its wrong use that is evil. Capital in some form or other will always be needed"
"Commonsense is the realised sense of proportion"
"Confession of errors is like a broom which sweeps away the dirt and leaves the surface brighter and clearer. I feel stronger for confession"
"Fear of death makes us devoid both of valour and religion. For want of valour is want of religious faith"
"For me every ruler is alien that defies public opinion"
"Gentleness, self-sacrifice and generosity are the exclusive possession of no one race or religion"
"Glory lies in the attempt to reach one's goal and not in reaching it"
"God is, even though the whole world deny him. Truth stands, even if there be no public support. It is self-sustained"
"God sometimes does try to the uttermost those whom he wishes to bless"
"God, as Truth, has been for me a treasure beyond price. May He be so to every one of us"
"I do not want to foresee the future. I am concerned with taking care of the present. God has given me no control over the moment following"
"I have also seen children successfully surmounting the effects of an evil inheritance. That is due to purity being an inherent attribute of the soul"
"I have nothing new to teach the world. Truth and Non-violence are as old as the hills. All I have done is to try experiments in both on as vast a scale as I could"
"I have worshipped woman as the living embodiment of the spirit of service and sacrifice"
"I know, to banish anger altogether from one's breast is a difficult task. It cannot be achieved through pure personal effort. It can be done only by God's grace"
"A 'No' uttered from the deepest conviction is better than a 'Yes' merely uttered to please, or worse, to avoid trouble"
"A coward is incapable of exhibiting love; it is the prerogative of the brave"
"A man is but the product of his thoughts what he thinks, he becomes"
"A man who was completely innocent, offered himself as a sacrifice for the good of others, including his enemies, and became the ransom of the world. It was a perfect act"
"A policy is a temporary creed liable to be changed, but while it holds good it has got to be pursued with apostolic zeal"
"A principle is the expression of perfection, and as imperfect beings like us cannot practise perfection, we devise every moment limits of its compromise in practice"
"A religion that takes no account of practical affairs and does not help to solve them is no religion"
"A vow is a purely religious act which cannot be taken in a fit of passion. It can be taken only with a mind purified and composed and with God as witness"
"A weak man is just by accident. A strong but non-violent man is unjust by accident"
"Action is no less necessary than thought to the instinctive tendencies of the human frame"
"All compromise is based on give and take, but there can be no give and take on fundamentals. Any compromise on mere fundamentals is a surrender. For it is all give and no take"
"All the religions of the world, while they may differ in other respects, unitedly proclaim that nothing lives in this world but Truth"
"Always aim at complete harmony of thought and word and deed. Always aim at purifying your thoughts and everything will be well"
"Among the many misdeeds of the British rule in India, history will look upon the act depriving a whole nation of arms as the blackest"
"I look only to the good qualities of men. Not being faultless myself, I won't presume to probe into the faults of others"
"I reject any religious doctrine that does not appeal to reason and is in conflict with morality"
"I suppose leadership at one time meant muscles; but today it means getting along with people"
"Increase of material comforts, it may be generally laid down, does not in any way whatsoever conduce to moral growth"
"Infinite striving to be the best is man's duty; it is its own reward. Everything else is in God's hands"
"Interdependence is and ought to be as much the ideal of man as self-sufficiency. Man is a social being"
"Intolerance betrays want of faith in one's cause"
"Intolerance is itself a form of violence and an obstacle to the growth of a true democratic spirit"
"Is it not enough to know the evil to shun it? If not, we should be sincere enough to admit that we love evil too well to give it up"
"It has always been a mystery to me how men can feel themselves honoured by the humiliation of their fellow beings"
"It is any day better to stand erect with a broken and bandaged head then to crawl on one's belly, in order to be able to save one's head"
"It is better to be violent, if there is violence in our hearts, than to put on the cloak of nonviolence to cover impotence"
"It is easy enough to be friendly to one's friends. But to befriend the one who regards himself as your enemy is the quintessence of true religion. The other is mere business"
"Man can never be a woman's equal in the spirit of selfless service with which nature has endowed her"
"Man falls from the pursuit of the ideal of plan living and high thinking the moment he wants to multiply his daily wants. Man's happiness really lies in contentment"
"Man lives freely only by his readiness to die, if need be, at the hands of his brother, never by killing him"
"Man should forget his anger before he lies down to sleep"
"Man's nature is not essentially evil. Brute nature has been know to yield to the influence of love. You must never despair of human nature"
"Measures must always in a progressive society be held superior to men, who are after all imperfect instruments, working for their fulfilment"
"Moral authority is never retained by any attempt to hold on to it. It comes without seeking and is retained without effort"
"Morality is contraband in war"
"Morality which depends upon the helplessness of a man or woman has not much to recommend it. Morality is rooted in the purity of our hearts"
"Non-violence requires a double faith, faith in God and also faith in man"
"Non-violence, which is the quality of the heart, cannot come by an appeal to the brain"
"Nonviolence is the first article of my faith. It is also the last article of my creed"
"One's own religion is after all a matter between oneself and one's Maker and no one else's"
"Only he can take great resolves who has indomitable faith in God and has fear of God"
"Peace is its own reward"
"Power is of two kinds. One is obtained by the fear of punishment and the other by acts of love. Power based on love is a thousand times more effective and permanent then the one derived from fear of punishment"
"Prayer is a confession of one's own unworthiness and weakness"
"Prayer is not an old woman's idle amusement. Properly understood and applied, it is the most potent instrument of action"
"Spiritual relationship is far more precious than physical. Physical relationship divorced from spiritual is body without soul"
"That service is the noblest which is rendered for its own sake"
"The difference between what we do and what we are capable of doing would suffice to solve most of the world's problem"
"The essence of all religions is one. Only their approaches are different"
"The good man is the friend of all living things"